Stainless steel is a steel alloy in which metal is added like chromium, nickel and molybdenum. Because of an extremely thin but very strong oxide layer on stainless steel, the material is durable, strong and there is no corrosion (rust). However it is not indestructible. If the material comes into contact with iron or iron particles (e.g. by welding, grinding) it can damage the protective coating and can lead to corrosion. Stainless steel is mainly used in areas that are used intensifely and where hygiene is important. 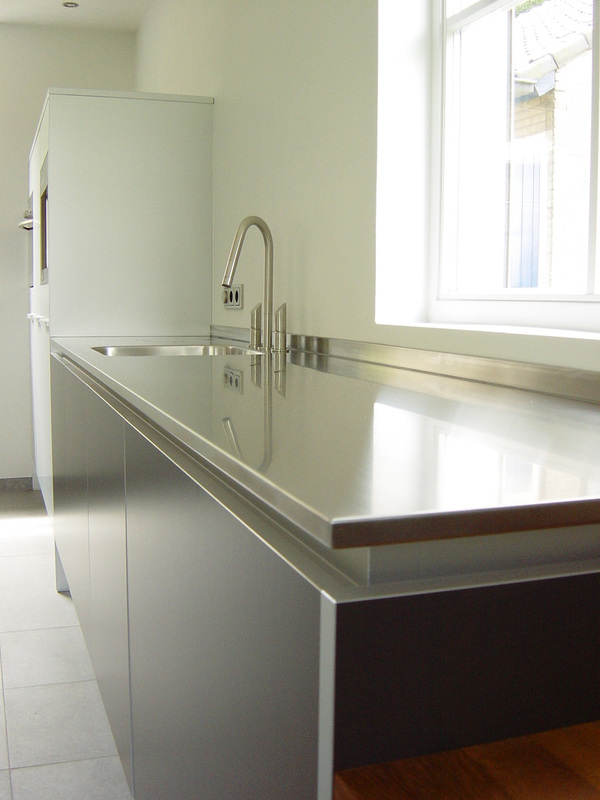 In professional kitchens stainless steel is being used for years because of its durability and strength. The fact that it is heat resistant, waterproof, easy to maintain and hygienic makes it perfect material for kitchens. For the kitchen studios we also notice an increased demand for it. This is because also the individual customer appreciates the practical and aesthetic qualities of this metal. Stainless steel is timeless and can be well combined with other materials such as wood and granite, it is increasingly used in the kitchen and home furnishings that are privately owned.